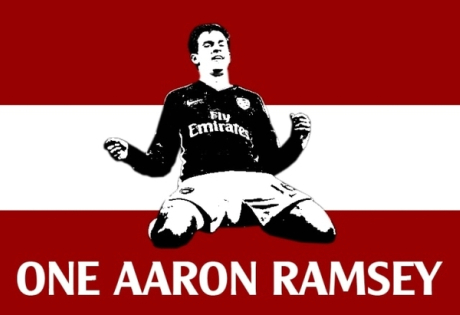 A banner of Aaron Ramsey is set to be displayed at the Emirates Stadium this Saturday during Arsenal’s Premier League match against Burnley. The 19-year-old was on the receiving end of a horrific challenge from Stoke City’s Ryan Shawcross on Saturday evening, with the Welshman sustaining fractures to the tibia and fibula in his right leg. Gunners supporters group REDaction have ordered an 18ft by 15ft banner which should be in place for the weekend’s league game. The design idea originated from popular Arsenal forum ‘The Online Gooner’. To help pay for it, they are accepting donations, large or small. They will get Aaron Ramsey to sign it, and when he is playing football again they will give it away to one of the people that contributed towards it. Think of it as a raffle, for a good cause, with a great prize.